Julia Bowlin, MD is designated as one of the "Nation’s Top Family Doctors" voted mulitple years by Consumer Research Counsel of America and a "Woman of Outstanding Leadership" by the International Women's Leadership Association. 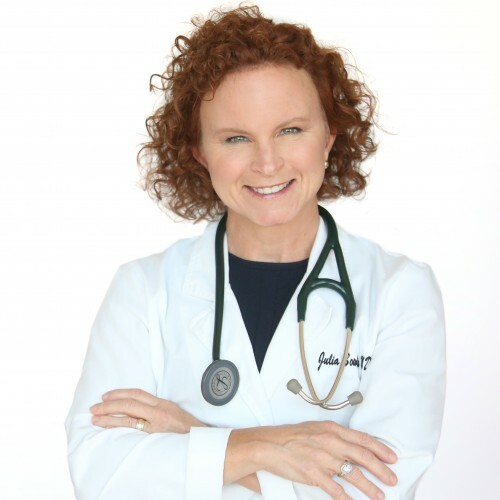 She is a practicing physician and in over 22 years as a doctor in private practice, Dr. Julia has implemented a blend of conscious awareness, personal responsibility, and conventional medicine. She is the founder of Personal Awareness Medicine™ and the creator PAWAR®(Personal Awareness and Responsibility) Process. Because of her past struggles with depression, self injury, and eating disorders, her Bachelor of Arts degree in Socio-Anthropology, and her Doctorate of Medicine degree, she has an intimate as well as professional understanding of how personal, social, and cultural influences impact one’s inner self and as a result one’s overall health and wellness. Dr. Bowlin has multiple platforms with which she professionally speaks. She speaks to the public, medical associations, and to corporations. She teaches medical providers how to excavate patient pertienent stories that are affecting their health and wellness. Dr. Julia works with corporations to help them assist their empoyees in gaining more personal awareness and responsibilty when it comes to how they think, feel, and behave in the personal and career lives. Dr. Julia's goal is that through Personal Awareness Medicine™ and her programs individuals can experience a clearer comprehension of their past, present, and future when it comes to how they think, feel, and behave resulting in a happier, healthier and wiser lifetime exprience. Find out more about Dr. Julia Bowlin at http://www.JuliaBowlinMD.com.